Alessandra Ammara is clearly sane. I only mention this because the regular pacing and controlled interpretation of these works are in marked contrast to the mental state of their composer. Schumann's bipolar tendencies are kept under strict control here, imbuing a sense of classical order to music that, in other hands, can so easily spin off in all directions. That said, she is closer to Florestan than she is to Eusebius, the dreamy, introspective side of Schumann's personality regularly coming to the surface. That can cause an imbalance; it exaggerates the flowing tenderness of the quieter music. But it is also present in the louder movements too, where it forms an elegant balance to the rigidity of Schumann's march rhythms. 'Control' is usually a dirty word when it comes to piano playing, especially if it involves the Romantic repertoire, but the more I listen to this recording, the more Ammara's sense of interpretive control endears her playing to me. Above all, it allows each cycle, and Carnaval in particular, to unfold as a narrative. Schumann’s teasing introductions to many of the movements are ideally paced, and Ammara has a rare ability to give her playing a furtive quality, even in the context of rock solid technique and note perfect execution. It is an impressive skill, and Schumann's poetics are an ideal medium to show it off. 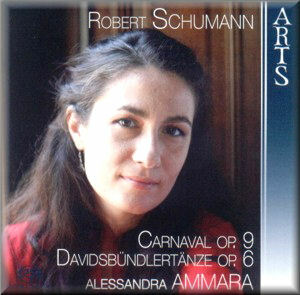 Rubato is a dominant feature of Ammara's Schumann, but paradoxically, this too fits into a style characterised by the utmost control. Phases are often structured with dynamic growth at the start and ritardando at the end, an affectation perhaps, but the consistency of the approach itself adds coherency. 'THIS IS AN AUDIOPHILE RECORDING' the liner declares as soon as you open the front cover. I can't argue with that, but it is interesting to compare the sound quality here to that of other recent SACDs of piano music. The microphones are positioned close to the piano, so ambience is at a premium. The notes of the phrases flow into each other well, even if the pianist’s strict phrasing keeps the phrases themselves distinct. The sound is clear, but it is never austere. And there is as much bass as you could want. The balance between the registers is also well judged, which is just as well considering how often Schumann requires the pianist to leap up the keyboard in octaves of cascade down in hoquets. We have reached September in what is turning out to be a major Schumann year for the record industry. The paucity of SACD recordings thus far is to be lamented, especially given the extent to which his intricate but forthright textures benefit from the technology. From that point of view, this release is to be celebrated. In terms of the interpretation, level-headed Schumann is a welcome change from some of the more emotionally charged offerings out there. It's probably not how the composer himself would have played this music, but that's not necessarily a bad thing.